Our event was held in conjunction with Wheelin' Walla Walla Weekend's Saturday Show-n-Shine. With over 400 cars participating in that event, we had excellent exposure to a wide regional audience of vehicle enthusiasts. 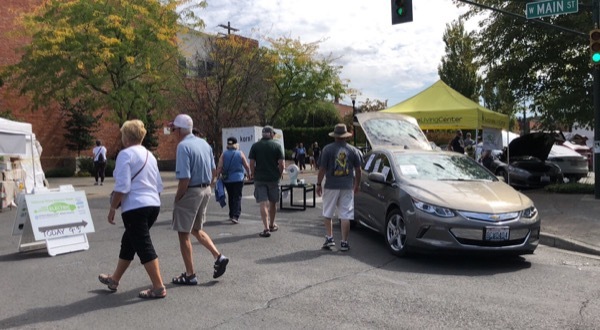 Our EV event was on Third Ave (Electric Avenue for the day), adjacent to Main St (eight blocks were closed for the show) and with a high visibility tent, 2017 Volt and her enthusiastic owner, and great signage pointing Main St. participants to the EV offerings. We had a Model 3 owner who was attending the show go to collect their vehicle and joined us on Electric Ave. for several hours unplanned. So much fun! The Mayor of Walla Walla, Barbara Clark, stopped by and received some good information from Garrett Brown, president of the Mid-Columbia EV Association about the need for charging infrastructure. The Walla Walla Drive Electric Week Event will be held in conjunction with the wildly popular Wheelin' Walla Walla Car Show on Saturday September 8th, 2018. Register for the show to line up on Main Street with hundreds of others OR show your electric vehicle on an adjoining side street. Our goal is to have as many different styles of full electric and plug-in hybrids on hand as possible. Education and exposure to the variety of vehicles that make up this segment is an important part of widespread adoption. Register as an attendee for the Walla Walla Drive Electric Week Event using the blue "Register" button on this page and complete a short survey for a chance to win $250. Visit the Downtown Walla Walla Foundation page for details about the car show and to register. https://www.downtownwallawalla.com/. Registered attendees report 20,686 electric miles driven.